During a plenary session at the German security think tank headquarter, foreign minister Dr. Mohamed Abdilahi Omar presented a briefing on Somaliland’s statehood. Quote- Thank you for inviting me to talk to you about statehood in Somaliland. I am very grateful to the Friedrich Ebert Stiftung and the Stiftung Wissenschaft und Politik for making this possible. Somaliland represents a bottom-up approach to state-building. Even before Somaliland reasserted its independence in May 1991, we began building peace at the local, village level. These meetings were heavily influenced by ordinary people, who had an interest in peace being re-established. We then held many conferences to allow us to reach a wider consensus and bring the Somaliland clans together. It is important to emphasize that the conferences largely took place in Somaliland. The process culminated in 2001 when the new constitution was adopted following a national referendum in which there was overwhelming support for Somaliland's independence. Since 1991, Somaliland has held two Presidential elections, one parliamentary election, and two rounds of local elections. In 2010, power was transferred peacefully between Presidents from different political parties. Our democracy is therefore vibrant, and we believe, a model for the region. Of course the transition in Somalia took place last year, putting an end to the TFG. President Hasan Sheikh's government enjoys wider support, thanks to the involvement of clan elders in Somalia in the selection process. I want to stress here that Somaliland wants a stable Somalia, and that we wish Hasan Sheikh's government well in their efforts to re-establish peace and stability. However, the Somali state is fragile, and depends for its existence on AMISOM troops. It does not, even now, control the whole of south central Somalia. It faces very considerable challenges, and the model of statehood developed by the UN on Somalia's behalf has not developed organically, and has yet to be endorsed by the people. I would like to talk now about Somaliland's views on the current approach of the international community to Somalia. We understand the international community's desire to support the Government of Somalia. As I said above, a stable Somalia is also in our interest. We are concerned, however, that the international community appears to be giving Somaliland less focus and attention as a result. Neglecting Somaliland now could undermine our achievements in democratic governance and stability. The international community should continue supporting Somaliland while working with Somalia. I know that fighting terrorism and piracy in the Horn of Africa are important issues for Germany. Somaliland will continue to support and contribute to the international fight against these scourges. We work directly with the EU's EUCAP NESTOR programme, UNODC and UNDP in building capacity for our Coast Guard and prisons. Thanks to international help we can house convicted pirates to standards compatible with international human rights law. Somaliland works directly with the UK, US, Ethiopian, Kenyan and other governments on cooperation in the fight against terror. Although Somaliland has done extremely well in preventing any terrorist attacks on its territory since 2008, the military efforts in the south have caused al-Shabaab to disperse, increasing the group's threat to the people of Somaliland. We have gone to great lengths to protect Somaliland from this threat. A large share of the government budget is devoted to security. The measures we are taking include increasing collaboration and communication between security and intelligence agencies; professionalizing and expanding the security forces; tightening border security and cooperation on border enforcement with neighbours; expanding police coverage to new areas; and addressing the root causes of terror, such as unemployment and other grievances. We look forward to building new partnerships on these issues, including with Germany. But we need further help from the donors to do so. Our security forces need sustained support: there is already evidence that Al-Shabaab is being displaced by AMISOM's military campaign and is stepping up its activity in Puntland. While we are on the subject of security, I want to say that the UK's changed travel advice for Somaliland on 27 January was a big blow for business confidence in our country, at a time when we are trying very hard to increase foreign direct investment. This has caused deep disappointment in Somaliland. We take very seriously our responsibility to protect foreign nationals living in Somaliland. We are working with the UK to try to achieve the conditions which would allow the travel advice to be changed back to what it was. Meanwhile, the government is trying to distribute Somaliland's development more evenly throughout the country. The country's eastern regions suffer disproportionately from under-development. This has enabled external agitators to exploit youth unemployment and mobilize low-levels of unrest, but we are taking major steps to correct such imbalances. We have incorporated credible leaders of some of these militias into government power-sharing arrangements; expanded security forces and government offices into these regions to provide for these citizens; and the president recently announced plans for $1.3 million of the government's 2013 budget to be allocated to development projects in the east. We are enormously grateful for Germany's aid, including future commitments. We are keen to see more development assistance delivered directly to the government instead of via international organisations or NGOs. This will greatly empower our government, and would be in line with the 2005 Paris declaration on aid effectiveness, which emphasizes the need to align aid with partner countries' priorities. We welcome the decision by the KfW Development Bank and GIZ to make a joint visit to Somaliland in the first half of 2013, and look forward to discussing our development priorities with members of the mission. Will Germany consider supporting the Somaliland Trust Fund which the UK and Denmark have established? 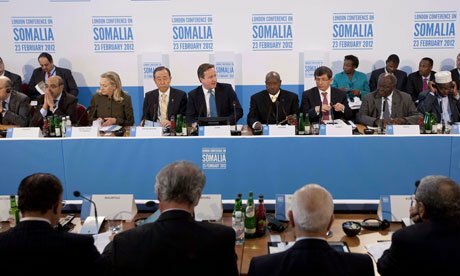 Turning to foreign relations, Somaliland's status in the region has grown significantly. We have currently entered into bilateral discussions with Ethiopia over agreements in the areas of security, trade, migration, education and use of the Berbera Port. We have received increased foreign direct investment and diplomatic visits from Djibouti, and work closely with the Kenyan government in regional stabilization efforts. Somaliland attended an IGAD meeting for the first time last year, and has also participated in regional meetings on piracy and the International Contact Group on Piracy. More widely, Somaliland has entered into bilateral and multilateral partnerships and agreements with other countries in the areas of immigration, border security, trade, development cooperation, pirate transfers and diplomacy. Particular success in cooperation has been experienced with Scandinavian countries (such as Finland, Sweden, Denmark and Norway), Gulf countries (such as the UAE, Kuwait), the US, the UK and the EU. I was invited to address the EU parliament's Foreign Relations Committee last year. Both the UK and Denmark have set up liaison and development offices in Hargeisa. The past year has been a busy one for Somaliland's foreign policy. Finally, I would like to talk in more detail about Somaliland's aspiration to be recognized as an independent state. My government, like its predecessors, makes no secret of the fact that we seek international recognition of Somaliland as an independent state. The Somaliland people confirmed their support for independence by voting overwhelmingly in favour of the 2001 constitution, and by supporting political parties committed to seeking recognition. Somaliland's quest for recognition is therefore a matter of self-determination.